The battle of the bulge is just as significant as it is for our pets as it is for humans. 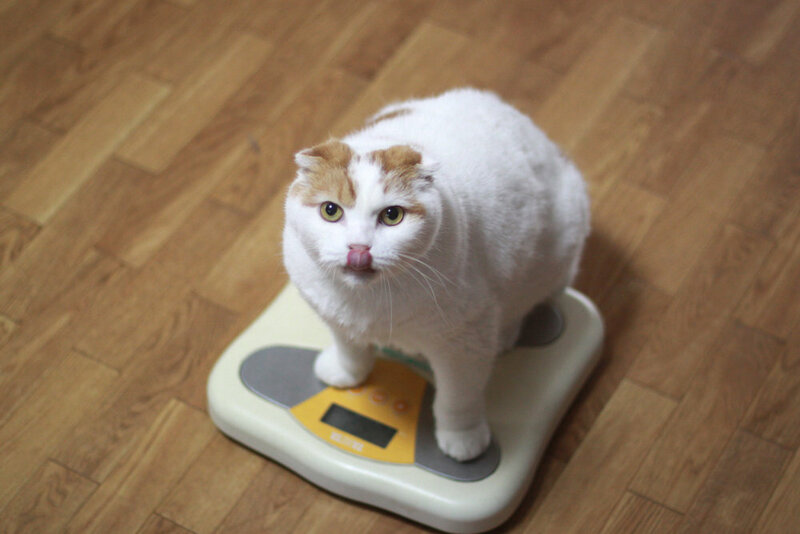 With over 65% of cats considered overweight according to an APPA survey, we must take steps to prevent our beloved felines from being unhealthy. Ailments range from the most severe—diabetes—to being unable to move around. Below are five things you can do to help keep your pet happy and healthy. While the healthy weight numbers may differ from breed to breed, check with your vet so that you can keep your cat within a healthy weight range. Tip #1: Get a complete physical exam for your cat including blood work so that you can receive an overall assessment of your cat’s health and come up with a plan of action. Tip #2: Pay attention to your cat’s diet. You are in control of the fridge, not your cat! Work with your veterinarian on portion control and to make sure you are meeting your cat’s basic nutritional needs. If you “Free Feed” you may have to change that habit in order to keep your cat’s diet under control. Tip #3: Be sure that your cat has plenty of exercise. If your cat is spayed or neutered, you will have to pay special attention to exercise as research indicates that spayed/neutered cats are more likely to gain weight. Teaser toys, lasers, and just a plain old simple game of throwing rolled up paper and playing a game of “fetch” for a half-hour a day. Consider getting another cat so that your cat has a companion to play with. Tip #4: Be sure your cat has plenty of fresh water to drink. Drinking water helps keep your cat’s system in check. Tip #5: Consult the Pet Obesity Prevention web site for more information on how to work with your vet. Be diligent in your quest to help your cat maintain a healthy weight and you both can enjoy the advantages of having your cat live a long and healthy life.